The lower house of the Russian parliament on Tuesday approved a bill increasing fines for bribes by up to 100 times the amount of the bribe given or accepted. Over 60% of people convicted of bribery in 2010 received a bribe of under 25,000 rubles with about 3% convicted of accepting a bribe between 150,000 rubles ($5,000) to 1 million rubles ($33,000), according to presidential envoy to the State Duma Garry Minkh. The bill provides for custodial sentence as an alternative to a fine, which has led critics to argue the new law is open to interpretation and could lead to abuses. They have also suggested that the size of bribes might grow as a result. President Dmitry Medvedev’s anti-corruption drive has so far yielded few practical results. The number of corruption-related crimes involving top government officials and large bribes increased 100% in 2010 year-on-year, Russian Interior Minister Rashid Nurgaliyev said in January. The Berlin-based non-governmental anti-corruption organization Transparency International has persistently rated Russia as one of the most corrupt nations in the world. 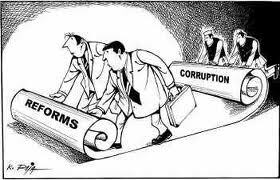 In the 2009 Corruption Perception Index, Russia was ranked 146 out of 180 countries, with a ranking below countries like Togo, Pakistan and Libya.